When it comes to breakfasts, there are few aromas better than that of bacon, sizzling and crisping in a pan. 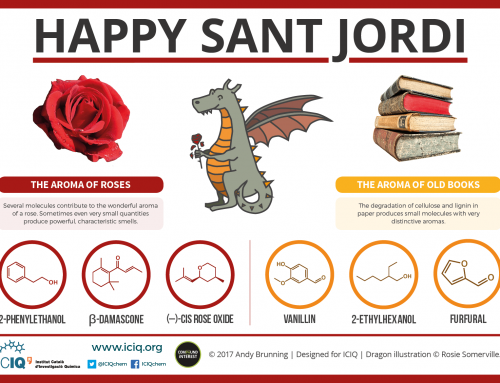 As part of a brief new series looking at the chemicals behind aromas, this graphic considers the chemicals that lend bacon it’s characteristically mouth-watering scent. Considering that bacon is such a universally worshipped food item, you’d’ve thought research on anything relating to bacon would be a hot commodity. The world of scientific research doesn’t seem to be quite as enamoured with bacon as the general public, however, and research on the compounds behind the aroma of frying bacon is surprisingly sparse. Clearly science has a few priorities to get in order. After some rooting around online, I was able to turf up one fairly detailed study, however. In this research, scientists tried to discover the compounds that give frying bacon its aroma, by comparing it with the aromas released when cooking pork loin. They did this by frying the meat, mincing it, then passing nitrogen gas over it to collect any volatile organic compounds that were being released. 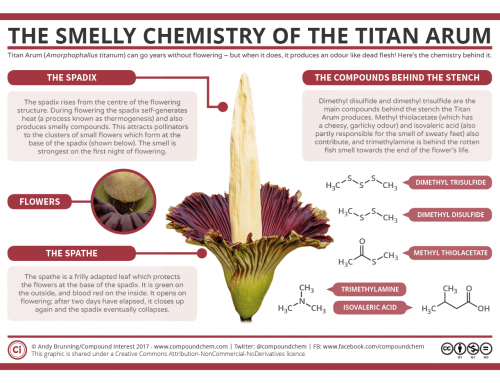 The collected volatile compounds were then passed through a gas chromatograph and mass spectrometer in order for identification to be carried out. The volatile compounds collected originate in part from the Maillard reaction, in which sugars in the foodstuff are broken down by reaction with amino acids as heating occurs. In bacon, other volatile compounds are produced due to the thermal breakdown of fat molecules. As well as this, in the case of smoked bacon, nitrite used in the curing process can also react with the fatty acids and fats present in bacon on heating – this leads to a higher percentage of nitrogen-containing compounds than in standard pork meat. 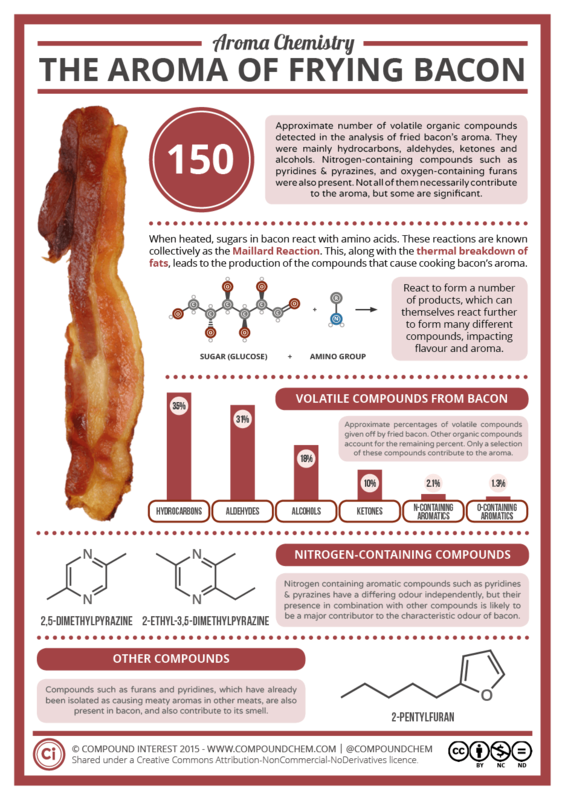 So, what compounds give bacon its aroma? The researchers compiled an exhaustive list of the volatile compounds present; they found that hydrocarbons, alcohols, ketones and aldehydes were present in large quantities in both the bacon and pork aromas. They also found some compounds present exclusively in bacon, and suggest that these play a major role in its scent. These were all nitrogen containing compounds; they included 2,5-dimethylpyrazine, 2,3-dimethylpyrazine, 2-ethyl-5-methylpyrazine and 2-ethyl-3,5-dimethylpyrazine. 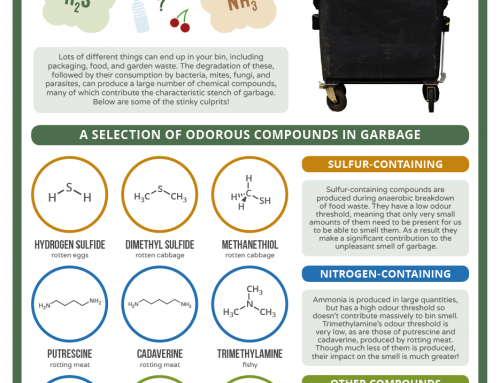 The researchers found that, individually, none of these compounds had the precise smell of bacon – however, they suspect that, combined, and in combination with other volatile compounds, it is most likely that they are responsible. 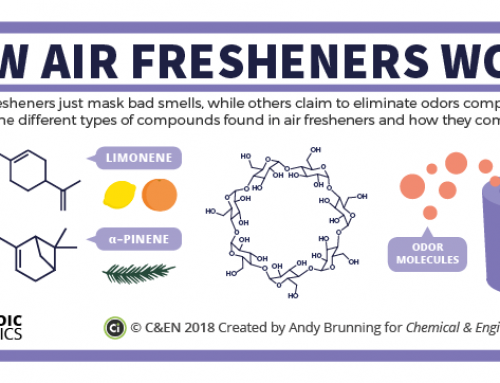 EDIT: Reactions, the American Chemical Society’s YouTube channel, made a short video based on this graphic, which you can view right here. 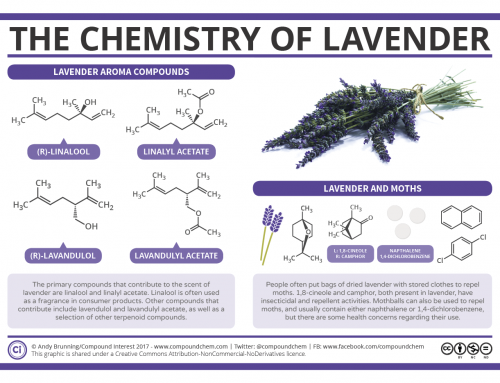 An edited version of this graphic and article will appear in the upcoming graphical book on the chemistry of food & drink, available to pre-order now! ‘A Study of the Aroma of Fried Bacon & Fried Pork Loin’ – M.L. Timón et al.